, an eminent English scholar, was born at Alkrington or Okerton, near Banbury in Oxfordshire, in 1572. 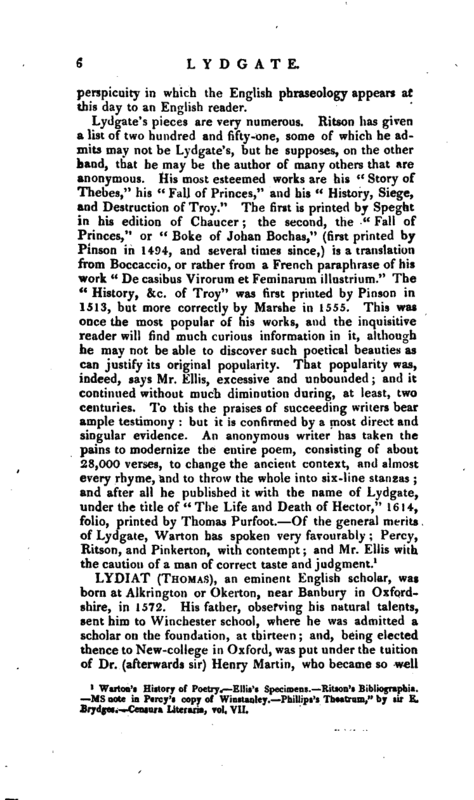 His father, observing his natural talents, sent him to Winchester school, where he was admitted a scholar on the foundation, at thirteen; and, being elected thence to New-college in Oxford, was put under the tuition of Dr. (afterwards sir) Henry Martin, who became so well | known during the rebellion. Mr. Lydiat was made probationer fellow in 1591, and two years after, actual fellow. 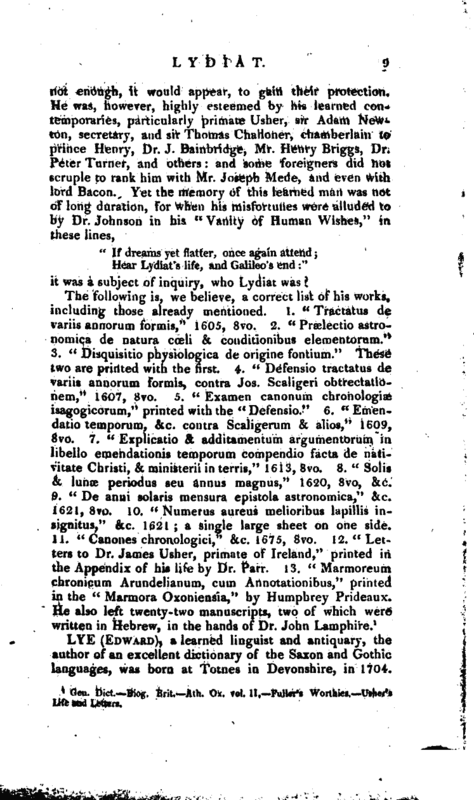 Then taking his degree in arts, he applied himself to astronomy, mathematics, and divinity, in the last of which studies he was very desirous of continuing; but, finding a great defect in his memory and utterance, he chose rather to resign his fellowship, which he could not hold without entering the church, and live upon his small patrimony. This was in 1603; and he spent seven years after in finishing and printing such books as he had begun when in college. He first appeared as an author in 1605, by publishing his “Tractatus de variis annorum formis.” Of this he published a defence in 1607, against the censures of Joseph Scaliger, whom he more directly attacked in his “Emendatio Temporum ab initio mundi hue usque compendio facta, contra Scaligerum et alios,” 1609. This he dedicated to prince Henry, eldest son of James I. He was chronographer and cosmographer to that prince, who had a great respect for him, and, had he lived, would certainly have made a provision for him. In 1609, he became acquainted with Dr. Usher, afterwards archbishop of Armagh, who took him into Ireland, and placed him in the college at Dublin, where he continued two years; and then purposing to return to England, the lord-deputy and chancellor of Ireland made him, at his request, a joint promise of a competent support, upon his coming back thither. This appears to have been the mastership of the school at Armagh, endowed with 50l. per annum in laud. When he came to England, which appears to have been in 1611, he is supposed to have been married, and to Usher’s sister; but for either supposition there seems very little foundation. Soon after his return, however, the rectory of Okerton becoming void, was offered to him; and though while he was fellow of New-college, he had refused the offer of it by his father, who was the patron, yet he now accepted it, and was instituted in 1612. 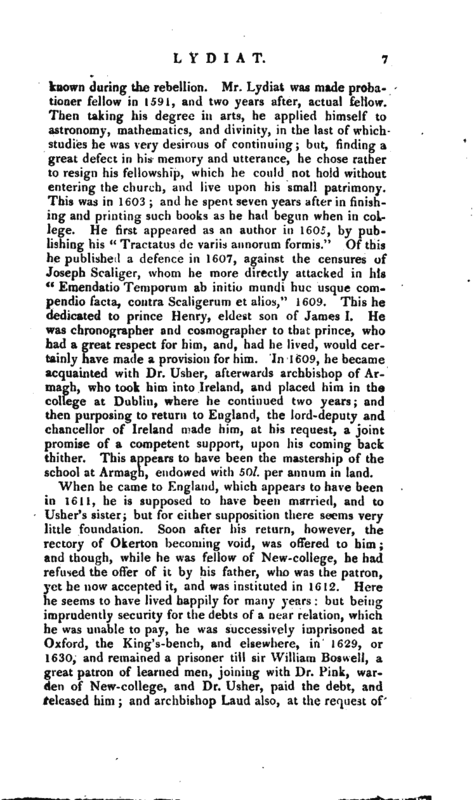 Here he seems to have lived happily for many years: but being imprudently security for the debts of a near relation, which he was unable to pay, he was successively imprisoned at Oxford, the King’s-bench, and elsewhere, in 1629, or 1630, and remained a prisoner till sir William Boswell, a great patron of learned men, joining with Dr. Pink, warden of New-college, and Dr. Usher, paid the debt, and released him; and archbishop Laud also, at the request of | sir Henry Martin, gave his assistance on this occasion *. 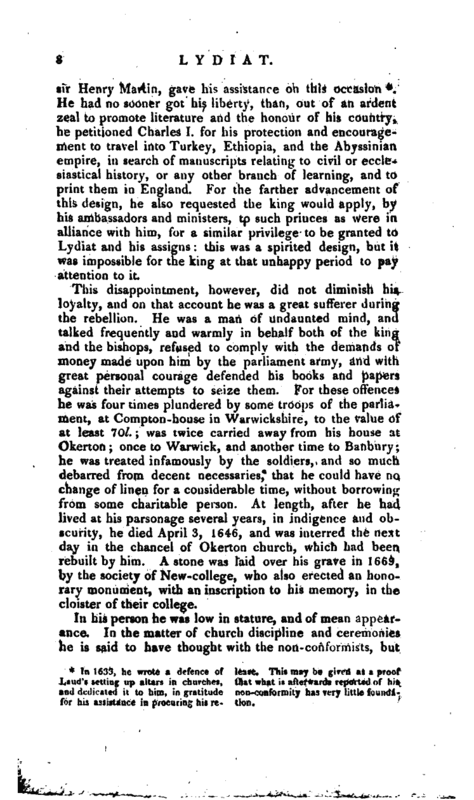 He had no sooner got his liberty, than, out of an ardent zeal to promote literature and the honour of his country, he petitioned Charles I for his protection and encouragement to travel into Turkey, Ethiopia, and the Abyssinian empire, in searcli of manuscripts relating to civil or ecclesiastical history, or any other branch of learning, and to print them in England. For the farther advancement of this design, he also requested the king would apply, by his ambassadors and ministers, to such princes as were in alliance with him, for a similar privilege to be granted to Lydiat and his assigns: this was a spirited design, but it was impossible for the king at that unhappy period to pay attention to it. This disappointment, however, did not diminish his loyalty, and on that account he was a great sufferer during the rebellion. He was a man of undaunted mind, and talked frequently and warmly in behalf both of the king and the bishops, refused to comply with the demands of money made upon him by the parliament army, and with great personal courage defended his books and papers against their attempts to seize them. For these offences he was four times plundered by some troops of the parliament, at Compton-house in Warwickshire, to the value of at least 70l. ; was twice carried away from his house at Okerton; once to Warwick, and another time to Bunbury; he was treated infamously by the soldiers, and so much debarred from decent necessaries, that he could have no change of linen for a considerable time, without borrowing from some charitable person. At length, after he had lived at his parsonage several years, in indigence and obscurity, he died April 3, 1646, and was interred the next day in the chancel of Okerton church, which had been rebuilt by him. A stone was laid over his grave in 1669, by the society of New-college, who also erecied an honorary monument, with an inscription to his memory, in the cloister of their college. In 1633, he wrote a defence of Laud’s setting up altars in churches, and dedicated it to him, in gratitude for his assistance in procuring his re lease. This may be given as a proof that what is afterwards reported of his non-conformity has very little foundation. Hear Lydiat’s life, and Galileo’s end"
it was a subject of inquiry, who Lydiat was. 1 Gen. Dict. Biog. Brit. —Ath. Ox. vol, II. Fuller’s Worthies. Usher’i Life and Letters.